Normalization of intrinsic neural circuits governing Tourette’s Syndrome using cranial electrotherapy stimulation. Qiao J, Weng S, Wang P, Long J, Wang Z. Normalization of intrinsic neural circuits governing Tourette’s Syndrome using cranial electrotherapy stimulation. IEEE Trans Biomed Eng. 2015;62(5):1272-80. The purpose of this study was to investigate if cranial electrotherapy stimulation (CES) can normalize the functional activity and intrinsic neural circuits of adolescents with Tourette’s Syndrome (TS) adolescents. This 24 weeks prospective study was done on the naturalistic use of CES by adolescents with TS. This article includes a subset of a larger study examining 8 adolescents with TS who had functional magnetic resonance imaging (fMRI) and completed the Yale Global Tic Severity Scale (YGTSS) before their first CES treatment and after their final CES treatment. The larger study included a total of 42 adolescents with TS (34 subjects completed the YGTSS only and the 8 adolescents who had baseline and post treatment fMRIs, and completed the Y-GTSS. There were two effectiveness endpoints (1) Data from fMRI (N=8) pre and post CES treatments, and (2) Scores on the YGTSS (N=42) pre and post CES treatments. Male or female right-handed patients (less than 12 years old) with a diagnosis of TS (according to DSM-IV) were included in the study. All the patients were physical healthy and had an IQ of no less than 100. The patients were drug free for at least one month before enrollment in the study. Individuals with the following conditions were excluded from the study; co-occurring anxiety and attention deficit hyperactivity disorder, current depression, and, current or previous history of psychosis. Data from fMRI and the YGTSS were collected for baseline measures. Baseline measures were done at enrollment, prior to the first CES treatment. Endpoint measures were done at the end of 24 weeks after the last CES treatment. The CES treatment procedures used in this study were consistent with current established standards for clinical practice. Each patient was instructed to set the Alpha-Stim SCS current between 10 and 500 µA using ear clip electrodes. The frequency was 0.5 Hz with a pulse duration of 2 milliseconds. Patients titrated the duration and current strength of CES to their perceived optimal level. They did one or two daily CES sessions, ranging from 20 to 60 minutes each. Functional magnetic resonance imaging (fMRI). Resting-state fMRI was performed on a 3T magnetic resonance unit (GE Signa Medical Systems, Twinspeed, Milwaukee) in the Renmin Hospital of Wuhan University. A birdcage head coil and restraining foam pads were used to minimize head motion. Functional data were acquired using a gradient-echo, T2∗-weighted echo-planar imaging with BOLD contrast pulse sequence. Thirty two contiguous axial slices that covered the entire hemisphere and brainstem were acquired along the AC–PC plane, with a 64 × 64 matrix (repetition time = 2000 msec, echo time = 30 msec, field of view = 24cm × 24 cm, and slice thickness = 4 mm without a gap). Yale Global Tic Severity Scale (YGTSS). The YGTSS is a clinician administered scale that is used to evaluate the severity of motor and phonic tics. The clinician describes a list of possible tics, first motor and then vocal tics, that may have occurred during the previous week. Once the tics that occurred over the previous week are identified, the clinician asks about the frequency, intensity, complexity, and the effect that the tics had in the person’s daily life. These dimensions are rated and the combined total can be used as a measure for overall tic severity. The YGTSS also includes a section that evaluates the overall impairment caused by the tics that is rated from 0 to 50. A score of 0 indicates that TS has no negative impact on a person’s life, while a score of 50 indicates a marked negative impact on the person’s life. Forty-three subjects were enrolled in the larger study. Subjects received daily CES treatments for 24 weeks and completed the YGSST at baseline and post CES treatments. One subject dropped out after one week of CES treatments for “lack of efficacy.” Eight subjects had fMRIs at baseline and after completing CES treatments, in addition to completing the YGSST at baseline and post CES treatments. Descriptive statistics were used for YGSST scores. Differences were examined using paired t-tests. For fMRI analysis, Independent component analysis (ICA) with hierarchical partner matching method was used to examine the functional connectivity between regions within cortico-striato-thalamo-cortical (CSTC) circuit. Granger causality was used to investigate effective connectivity among these regions detected by ICA. The authors then performed pattern classification on independent components with significant group differences that served as endophenotype markers to distinguish the adolescents between TS and the normalized ones after CES. 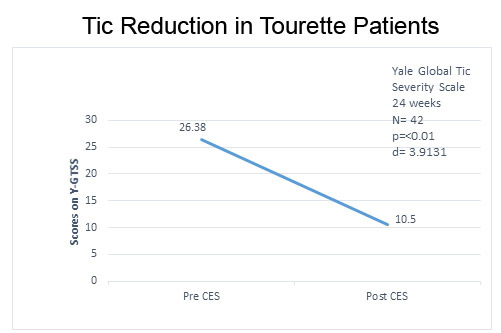 The decrease in YGTSS scores indicating a decrease in motor and vocal tics from baseline to the end of 24 weeks of CES treatment was highly significant, p = < 0.01 (Figure 1). Figure 1. Decrease in motor and verbal tics of TS from baseline to after CES treatments. The effect size, d = 3.913, was ≥ 0.8 and therefore considered large (Cohen, 1988). After CES, subjects exhibited altered spontaneous functional connectivity in brain areas within the CSTC circuit involved in motor generation or control, including SMA, caudate, PFC, ACC, and default mode network (DMN), primary in PCC. The functional activity and connectivity in motor pathways were suppressed, while activations in the control portions of CSTC loop were increased in subjects after CES compared with before CES. The normalization of the balance between motor and control portions of the CSTC circuit may result in the recovery of TS adolescents. This was a non-experimental, naturalistic study that was done to determine if CES may be beneficial for individuals with TS. A strength of the study is the investigators used baseline and post-treatment fMRI scans in a subset of the subjects to identify changes in brain function. The design was appropriate for this study as a critical review of the literature revealed no previous research could be found on using CES to treat TS. This initial, exploratory study provides a solid foundation for a larger, randomized controlled trial that examines the efficacy of decreasing the motor and vocal tics of TS. The distinction between functional and effective connectivity is essential to understand when interpreting the results of studies like the present one. Functional connectivity describes the statistical dependencies between two or more variables (e.g., regions of neural activation within the brain). These dependencies can be undirected (as in correlation analysis) or directed (as in Granger Causality and “transfer entropy”; Granger 1969). Importantly, functional connectivity analyses make minimal assumptions about the physical underlying mechanisms of action. In contrast, effective connectivity aims at finding the simplest possible circuit diagram explaining observed responses (Friston, 2013). For example, models of effective connectivity allow researchers to compare how well distinct mechanistic models perform given an observed set of data. The effective connectivity approach is exemplified in Dynamic Causal Modeling (DCM) within a Bayesian statistical modeling framework. However, DCM is suited for (a) models where only a few regions of activation have been identified (or will be) and (b) models to be theoretically posited aprior (i.e., it is a theoretically driven, model testing approach to understand neural mechanisms of action propagating upward to the network level). When little is known apriori about the mechanistic nature of the neural system as in the present study, an attempt is made to bridge functional and effective connectivity approaches to provide a foundation for understanding the mechanism(s) of action that can then lead to models of effective and functional network connectivity. To this end, the authors use a state-of-the-art approach, independent components analysis (ICA) to identify regions of activation (from BOLD signal data acquired using fMRI) that are involved in resting state fMRI data with TS patients. This step is followed by hierarchical partner matching (HPM) to identify functional brain networks. Next, Granger Causality was used to test for significant causal relations between identified regions of interest (e.g., see Table II, p. 1277). Granger Causality captures temporal properties of fMRI data while also controlling for the simultaneous regression of all variables in the model (these models are also known as multivariate autoregressive time series models (Price, 2012). Finally, the authors also used pattern recognition methods based on resting state fMRI data to verify the normalization in intrinsic brain functional activity and activation connectivity between TS patients before and after CES treatment. One challenge when studying a condition such as TS is that the disease involves the motor and control systems from a biophysical and neural perspective. Importantly, the authors found that the “motor” and “control” parts of the CTSC system lack normalization in TS patients. Specifically, the authors here found that an increase in functional activity and connectivity in PCC suggesting normalization (i.e., return to a state similar to that of non-TS) of functional deficits associated with impaired motor inhibition. In this study the researchers examined blood oxygenation level dependent (BOLD) fluctuations and intrinsic brain functional connectivity based on resting-state functional MRI data. The researchers used an independent cluster analysis (ICA) at the individual level followed by hierarchical partner matching (HPM) to identify functional brain networks in resting state condition. The use of the ICA algorithm with HPM provided a solid analytic strategy for identifying ICs that were reproducible across individuals. The number of ICs to generate for each subject was determined by using minimum description length (MDL) for the lower bound and Akaike’s Information Criterion (AIC) for the upper bound. The interval for their study was between 20 to 130 clusters (with an interval or increment of 10). To the authors’ credit, they employ cross-validation approaches to investigate the tenability of their regional activation identification strategy based on the before and after CES subject data. Cross-validation is an important step when exploratory search strategies are used in high density data structures. Granger causality was also used to measure causal interactions among components of the cortico-straito-thalamo-cortical (CTSC) circuit that generates or controls motor behavior. The present study provides many strengths methodologically and analytically. Overall, the methodology and analyses used are well-suited and represent the current state-of-the-art considering the goals of the investigation. Certainly, replication with a more rigorous design is recommended given the sample size and the fact that no sham group was employed. A recommended future study is to include randomized controlled trial (RCT) using a control (sham condition) and treatment (CES) condition. Additionally, given the findings of the present study, it is possible to posit a theoretically mechanistic model that can be formally evaluated using DCM analysis. Finally, as the authors correctly note, fMRI scanner noise may affect subjects in different ways (i.e., may affect subject-specific fMRI BOLD signals). Therefore, silent techniques such as EEG should be used to compare the results with those obtained using fMRI data. Friston, K., Moran, R., Seth, A.K. Analyzing connectivity with Granger Causality and dynamic causal modeling. Neuroimage. 2013; 19:1273-1302. Price, L. R., (2012). Small sample properties of Bayesian multivariate autoregressive time series models. Structural Equation Modeling. 2012; 19(1):51-64. Granger, C.W.J. (1969). Investigating causal relations by econometric models and cross-spectral methods. Econometrica, 1969; 37:424-438. Jianping Qiao is a Lecturer at College of Physics and Electronics, Shandong Normal University, Jinan, China. Shenhong Weng is an Associate Chief Physician and an Associate Professor at Renmin Hospital of Wuhan University, Wuhan, China. Pengwei Wang is a Lecturer at the School of Information Science and Engineering, Shandong University, Jinan, China. Central South University, Changsha, China. Zhishun Wang is an Associate Professor in Brain Imaging with the Department of Psychiatry at Columbia University, New York, NY, USA, and New York State Psychiatric Institute, New York.